Some friends who have visited Crystal Lagoon or more precisely the Treasure Bay Airplane in Bintan Lagoi, Riau Islands Province. Hear their exciting story and also with very interesting photo photos. Finally I also decided to look at the area. Moving on from a deep sense of curiosity, and also want to feel what friends have ever felt from the sensation in the swimming pool in the concept of a beach. This pool seems luxurious and really good, and there is also a scooter ride that can be tried. The rides that are there we can go up with the calculation of the deposit that we have entered which we must spend that day, if we don’t spend it, it is feared that the deposit will not be used anymore. For those of you who feel less brave to swim in the open ocean, I think this is the right place to be able to free fall in the swimming pool that is designed with shades of beach and there is also beach sand but placed on the edge of the outer edge of the pool that is almost never touched by water. For the water they use like sand which is made of fiber and is white in color like the sand of the beach. It is said that the Treasure Bay swimming pool is the largest in Southeast Asia, with a swimming pool area of around 6.3 hectares. By giving the feel of a beautiful garden garden by the pool. From our parking lot, on foot or choose to be pampered with environmentally friendly vehicles that use electricity and certainly without noise. Quoting from batam.tribunnews.com Ananda Youhan as Sales Manager of Aston Hotel Tanjung Pinang who expressed his comment that Treasure Bay is the newest vehicle that can be enjoyed starting from March 2016. Are you a person who likes traveling? For those of you who like traveling, it might not be foreign to the name Bintan Island. This island adjacent to Singapore, is the largest island located in the Riau Islands. Which consists of 3000 large and small islands, which is certainly very interesting and very suitable to be used as a tourist spot for you. Bintan not only has many islands, but also has extraordinary natural beauty. 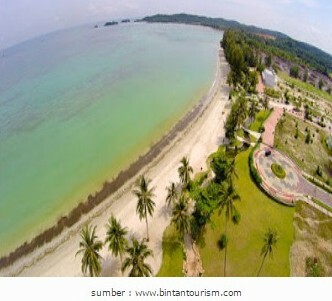 Bintan Island is currently one of the favorite tours in Riau Islands Province (Kepri). When you hear the word Bintan, you might think that there are some interesting resorts to visit. Don’t be wrong, guys, the natural scenery is no less great with views on Bali, Lombok or Batam. The beauty of nature and the cultures owned by Bintan Island certainly can make you imagine a beautiful beach accompanied by luxury resorts. Bintan Island is very close to Singapore and also one of the largest islands in the Riau Islands Province. 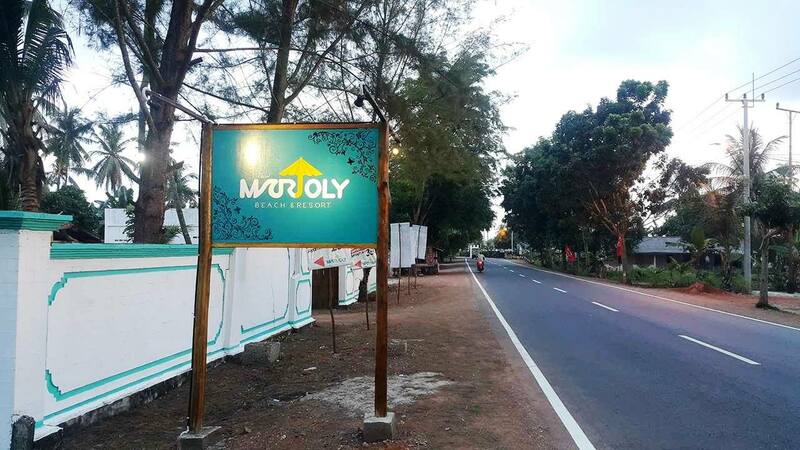 New Marjoly Beach Resort is located in the Bahari Tourism Area, Kawal, Kepulaun Riau. The place is quiet and away from the crowds, very suitable for those of you who want to calm down from the hustle and bustle of the city. Its clean and beautiful place makes you feel comfortable and at home here. As the name suggests, this place is a beach with classy resort facilities. 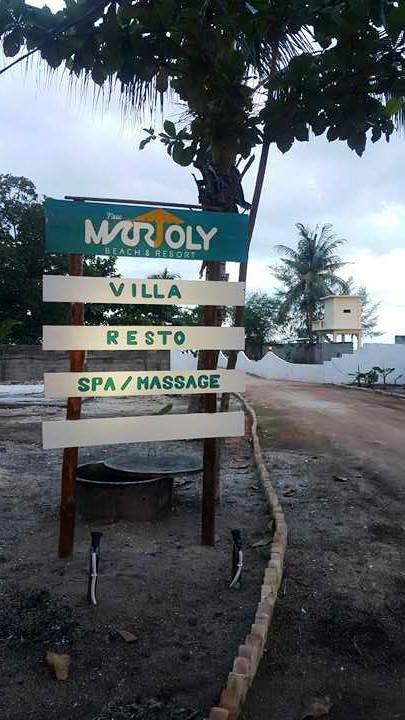 New Marjoly Beach Resort includes new tourist spots on Bintan Island. On the beach there is a hammock that will make you more relaxed by feeling the cool beach breeze. A soft stretch of sand makes you like playing with sand. The sea on this beach is so shallow suitable for you who just want to wet your feet while chatting with friends or family. If you want to swim maybe you have to walk 100 meters so you can swim with a standard depth. You can also rent a scooter to get around on the beach. Besides its stunning beaches, the resort is also fantastic. Spacious rooms. The place is clean and neatly arranged to make you not regret staying here. Friendly service will also meet me. Each room has a bathroom which is also quite comfortable for you. On the balcony you will also be presented with views of the beach that spoil the eyes. Very relaxed and calm, without any noise made him feel at home for a long time at this New Marjoly Beach Resort. Besides that, the food offered here is also very tasty. Your tongue will be truly spoiled with a variety of typical delicacies available at New Marjoly Beach Resort. The waiters and receptionists are kind and friendly, making you feel like in heaven. You will feel unexpected comfort, until you don’t feel time passing so fast. Moreover, this place is also suitable for those of you who are newly married and want to honeymoon together with a partner. Because the place is quiet and calm, romance will be created. Various resort facilities will also spoil you who want a romantic meal at a restourant near the resort. Until you feel comfortable and feel like your own home. So for those of you who are having a hard time with all the work activities, it’s not wrong for you to choose this place to calm yourself from the stressful city bustle. Because the place is so quiet and calm, makes you feel at home for a long time. Are you interested in traveling to New Marjoly Bech Resort? You can book places and hotels there first, so that you are more comfortable and immediately rest there. Lagoi Beach is located in North Bintan, Bintan Regency, Riau Islands. Rows of coconut trees and their beautiful natural scenery and clean environment attract tourists. In addition to beautiful scenery, on Lagoi Beach there are also areas of Mangrove and Sebong Rivers. Which makes tourists more interested in visiting here. At Lagoi beach you can do activities such as diving, snorkeling, swimming and sunbathing on the white sand of Lagoi Beach. And not only that, you can even fish around the mouth of the Sebong river, and can burn fish there. Exclamation isn’t it? Lagoi Bay Beach is a beach located in an exclusive area, with hotel, shops and cafe facilities. The area is so neatly arranged and clean with flower gardens that are increasingly beautifying Lagoi Bay Beach. Don’t worry, for those of you who only have a little pocket, even though they are in an exclusive area, this beach is free to visit anyone without being charged. Then you will be more enjoyable traveling to this beach. Pantai Trikora is located 45 Km east of the Riau Islands, Tanjung Pinang. Precisely in Malang Meeting Village, Gunung Kijang District, Bintan Regency. Trikora Beach also has a stunning natural beauty of the beach. Lots of interesting facilities there. Along the way to Trikora Beach you will be spoiled with views of fishing houses lined up, luxury resorts to mangrove forests. There you can fish, snorkel, play kites and interesting ones you can also, rent a tour package to visit uninhabited islands. Waw it’s amazing isn’t it? You can also go on a culinary tour with a variety of special foods on the island of Bintan. Are you interested? It turns out that Bintan is not just a beach, it’s a suitable place for you to take a natural tour. There is also Mount Bintan Waterfall. 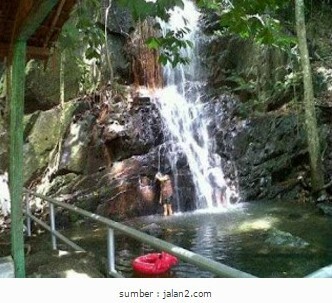 This waterfall is located 55 Km from Tanjung Pinang. More precisely located in Bekapur Village, Bintan Buyu Village, Teluk Bintan District, Bintan Regency, Riau Islands. Getting to the Waterfall can take 40-60 minutes. Unlike the other waterfalls, the Gunung bintan waterfall is not so high. And maybe only has a height of about 7 meters, with little water discharge. Even so, the surrounding natural scenery that looks beautiful and natural is the main attraction for the eyes. Where there are still many large trees and various kinds of plants that seem to be rarely touched. Even there you can also climb Mount Bintan, to see the natural scenery from the top of Mount Bintan. Your trip will definitely be more exciting. First there you will be immediately amazed by the natural beauty of the Sebong River. Yes, the Sebong River which has this unique natural beauty is located in the Sebong Lagoi Village, Sebong Bay District. As far as the eye can see, when you walk down the Sebong River, you will be spoiled with various Mangrove Forests, and Mangrove Forest dwellers such as monitor lizards, mangroves and birds such as herons that make you enjoy traveling here. Besides you can fish in the Sebong River. You can also see the fishing skills around the river in search of fish around the Sebong River. You are guaranteed to be addicted to travel here again. This lake is located in Galang Batang, Bintan Regency. If from Batam, this lake is close enough, it might only take 20 minutes. This lake is called the Blue Lake because the lake water here does emit blue when the weather is sunny, and the beautiful scenery adorns the Blue Lake area. Actually, this lake is not a natural lake, this lake used to be a deep quarry of sand mining. Because this place is not a tourist place, so there are no facilities in it. But the scenery there is enough to impress you for a relaxing walk to the Blue Lake. Tourist in Bintan is not just beach or forest loh. There are also other tourist attractions, namely Avalokitesvara Vihara. The monastery, known as the largest monastery in the world, is located in Water King Village about 14 Km from Tanjung Pinang City Center. Its neat and clean place is perfect for you who want to berselii ria. If you want to visit and photographs, it would be nice if you first asked the officers which parts to visit and not. For this Vihara is a place to worship as well. In addition Penyengat Island is also famous for its beautiful and beautiful nautical. Make you feel at home for long on this island. How about it Not exciting, guaranteed you will never forget to travel here. Statues of Gorillas and Bintan turtles can be your destination for self-portraits. This statue is in a separate area after the journey from Treasure Bay. Senggarang is a residential area in Bintan Island, Riau Islands. This area is famous for Chinatown in Tanjung Pinang. Here you will see many stage houses that still use wood foundation. Bintan Island is one of the islands that are located in the vicinity of Singapore, about 30 miles. Bintan Island is also one of the largest islands in the Riau Islands Province (Kepri) in Indonesia. Bintan Island is one mainland with Tanjung Pinang which is one of the capitals of Riau Islands Province (Kepri) or Wonderful Riau Island, Wonderful Kepri and also Wonderful Indonesia which is very worthy to visit (Kepri Visit). 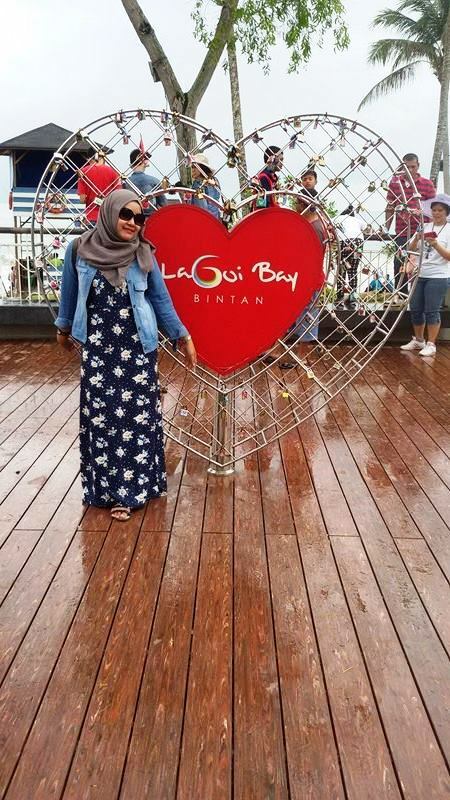 With the Resort Tourism Center which is also known as Lagoi, it can be said that Bintan Island Lagoi Kepri can be a cheap tourist area with a travel tour that can be trusted to be satisfying and also gives a luxurious holiday feel but with a very simple pocket. Bintan Island is very attractive for local Indonesian visitors and international tourists from several countries. Has a distance of about 11 miles from a sandy beach and also has very many cultural attractions in Tanjung Pinang City. Bintan Island is one of the choices for families and backpackers as well as tourists to be able to get a very satisfying vacation and also with a cheaper price with a very amazing tour. Travel to the ferry terminal at Harbourfront Singapore or Tanah Merah Ferry terminal by taxi, bus or train (MRT). Ask the hotel staff where you stay the MRT guide map or bus. Choose a taxi if you prefer comfort. 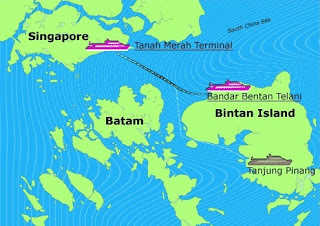 Buy ferry tickets from Bintan phrase resort (brf.com.sg), to travel to Lagoi, or penguin phrases (penguin.com.sg), to Tanjung Pinang. Choose one way ticket or return ticket, purchase with return ticket you will get a fairly large discount. Go to Ferri if you have obtained permission from the officer. Apply for a visa upon arrival, both for 30 days, if you do not have a visa for Indonesia. Adjust the hours for local time, one hour behind Singapore, immediately after arrival. The trip will take approximately 1.5 hours to Tanjungpinang or to Lagoi, according to your chosen destination. Lagoi Beach is a place of pride in Indonesia in the Riau Islands, which is located in Bintan Regency. Natural and hygienic scenery with the characteristics of a row of coconut trees on the beach is a special attraction for tourists who come to Lagoi Beach. In addition to Lagoi beach attractions, in the Lagoi region there are several tourist areas that are no less interesting, namely Mangrove Forest and Sebong River. Tracing the river by boat is like tracing a secret place on Amazon. Each of these regions has its own appeal. In addition there are also various kinds of lodging and resorts, resulting in this global class tourist attractions. What’s new is Treasure Bay, the largest swimming pool in Southeast Asia. Since it was opened to the public in mid-2015, the swimming pool is always crowded with visitors from both domestic and overseas. Some of the activities that you can do on this attraction are, playing water, swimming, snorkeling, diving and just sunbathing on the white sand of Lagoi Beach. In addition to enjoying the natural charm of Lagoi Beach, you can spoil yourself and your family to rent a resort on this beach. Resort comfort can add to your holiday fun using relatively adequate facilities such as golf courses, swimming pools and spas. For those of you who are adventurous, explore the charm of the Sebong River by using a boat that you can rent with your family. During traveling along the Sebong River, you will be treated to extraordinary natural scenery, namely various kinds of plants, especially mangroves and nipah trees and wild animals that live naturally on the banks of this river. To reach Lagoi Beach attractions, you can start the journey from Tanjung Pinang using exclusive four-wheeled vehicles or public transportation like taxis or four-wheeled rental vehicles. 1 hour distance from Tanjungpinang. You can use the old road or new road in the southern part of Bintan. However, if you are from Batam, you must use a crossing service from the Telaga Punggur port. Coming from this port, you can use a speed boat to Tanjung Uban. Arriving at Tanjung Uban, you can continue your trip using a taxi. It takes about 25 minutes from Tanjung Uban. But if you bring your own vehicle from Batam, you can use the Roro ship from the back port. The Riau Islands tourist attractions have various kinds of facilities and accommodations that are deliberately built to spoil the tourists who come to visit Lagoi Beach. These facilities include lodging using lots of classes, villas, resorts, one of which means Ria Bintan Golf Lodge. There are also restaurants, restaurants, souvenir shops, lay bathrooms and toilets, large parking lots, fishing, diving and snorkeling rentals. Don’t miss tasting Bintan’s special culinary, namely the brain-brain and gonggong. Otak-otak is a marine fish that is presented in a way wrapped in strawberry leaves. While barking is food in the form of a nautical snail served like satay. Overall Treasure Bay is a Waterfront Resort City with a total area of ​​338 hectares located in Lagoi, Bintan Island, Riau Islands, Indonesia. The resort is integrated with various sports facilities, hotel rooms are tent-shaped like villages and swimming pools. Treasure Bay swimming pool is the largest in Southeast Asia. The pool area itself is 6.3 hectares of sea water. So don’t be surprised if you swim salty water. the edge on the sloping design is similar to the beach, only does not use sand but is made of fiber fibers painted in sand-like color. The original sand remains, only placed on the outer side of the pool. Treasure bay is equipped with a variety of game rides such as sky water, solar speedboats, water jets, water bikes, canoe, and balloon pools for children. Visitors can also rent a scooter motorcycle to surround the area. You do not need to worry if you bring children to swim and play in the pool, because Treasure Bay has prepared “Bay Watch” officers who are always on the side of the pool. For information, you are not allowed to bring food and drinks from outside. Inside there is a cafe for eating and drinking. Please keep the environment clean, do not litter. Bintan is indeed well-known as a hidden gem in western Indonesia. This island is not widely known in domestic travelers but its beauty is silent and stole the attention of world travelers. Just look at how many hotels in Bintan operate on the largest island of the Riau Islands province. Some of us might not have thought that in western Indonesia, there was a luxury sightseeing destination that could rival the island of Bali. Bintan Island, an island adjacent to Malaysia and Singapore, is suitable to be an international tourist destination. This region is able to compete with luxury resorts in neighboring countries. Here are 10 resorts that will make your vacation on Bintan Island become more luxurious. One area of ​​gathering of starred resorts in Bintan Island is in the Lagoi Bay region. Treasure Bay is one of them, a luxury resort that desires to produce Lagoi sightseeing areas not just an area for travelers. Companies that have this resort have proven to be in the same profession as Canyon Ranch, managers of world-class spa resorts from America. Treasure Bay Resort is located on the beach which automatically panoramas exotic will be the main treat for guests staying there. The management knows very well if Bintan Island has a really good prospect and is impossible to produce as a second Bali which means it will become one of the centers of tourism in Indonesia. Met Bintan Club is also located in the Lagoi Bay area and has been transformed as one of the resorts that provide comfort and tranquility to its guests. This resort is in a strategic location and easily accessible from various places. Most of the guests who come to this resort come from neighboring Singapore. Travelers from Singapore came to apply the Katamaran ferry by reaching 55 minutes from Singapore’s Tanah Merah Ferry Terminal. For domestic travelers to access this area from the city of Tanjungpinang through a land trip for 1 hour. Next to the Met Bintan Club there is an exclusive golf course and one of the best in Asia called Ria Bintan Golf Club. Who says tourism on Bintan Island will feel much different from Bali? For those of you who are already in love with the Island of the Gods, can choose Nirwana Garden Resort as an area to stay all while traveling. This resort is located in the Lagoi Bay region and has a truly thick Balinese feel. The feel of Bali is immediately felt when the traveler enters the main lobby, the interior decoration does adopt the taste of the Island of the Gods. In this lobby also often performed a complete national dance with a beautiful gamelan beat. 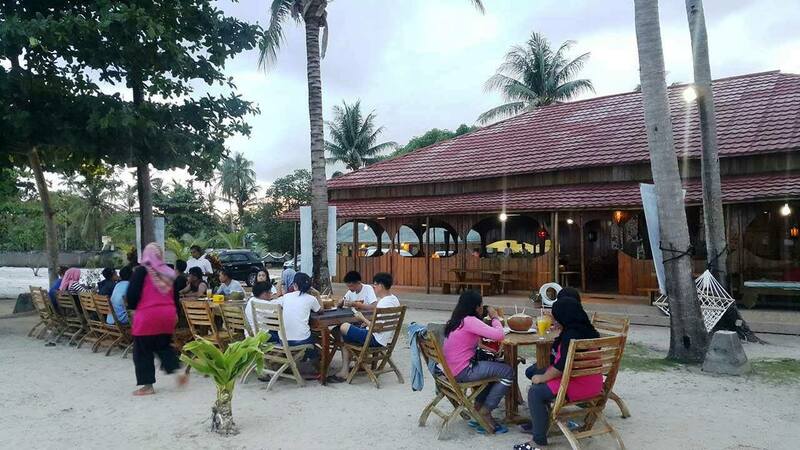 After that the traveler can take a walk around the resort feeling the beauty of the beach, tasting various games on the outbound arena, to feel a variety of appetizing dishes in the floating cafe called Kelong Restaurant. Still occupying the Lagoi Bay area, Swiss-Belhotel Lagoi Bay Resort is one of the convenient option resorts to be used as a tourist destination. Panorama of the sea is the main treat for guests staying at this resort. Swiss-Belhotel Lagoi Bay Resort is located really close to Singapore and can be reached by ferry for 45 minutes from Singapore and 15 minutes from Bandar Bentan Telani Ferry Terminal. This 4-star hotel stands majestically next to Plaza Lagoi Mall and is in the middle of a cooking center on Bintan Island. An ideal area for luxury tourism on the island. Tours on Bintan Island are incomplete if you don’t visit Loola Adventure Resort. Because this is one of the luxury resorts and the top of the island is actually recognized by the world with their title at the 2015 World Travel Market arena in London in November 2015. If the event is Loola Adventure Resort becomes an ordinary champion in the 2015 World Responsible Tourism Awards. This title is certainly not a mediocre title, because the evaluation was carried out by 12 world tourism figures. If it works, Loola Adventure Resort subverts 37 other finalists from various countries. As quoted from Bintan Portrait, responsible tourism is tourism that refers to the interests and survival of nature and local communities both in terms of social traditions, security, order and economic benefits. As long as you know that almost all of the resort’s employees are recruited from the Bintan community, you know. Banyan Tree Resort is one of the resorts located in the Tree Resort area where in this area there is also Angsana Resort & Spa Bintan. The legitimate name of this resort is the Banyan Tree Resort and Spa Villa and the parent company does not only have luxury lodging in Bintan but also exists in China, Korea, Maldives, Mexico, Vietnam, Thailand and various other countries. 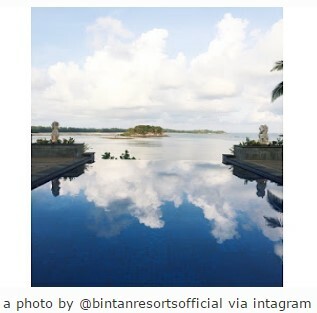 Feeling in Indonesia except in Bintan, Banyan Tree Resort is also present on the Island of the Gods. Besides having a place that is certainly comfortable, the resort also has a swimming pool overlooking the sea in Lagoi Bay. The panorama of the resort’s garden and swimming pool is truly unusual. It is not a quiet rural atmosphere with complete and cozy facilities that a traveler can get at The Canopy Resort. Lodging in this area are designed like unique cottages with retro designs like the lives of Europeans in medieval times. Such facilities are still equipped with artificial beaches that are connected immediately to the main beach at the end. All cottages also have jacuzzi equipment, so after swimming in the beach the traveler can immediately relax and soak in this pool. Angsana Resort and Spa Bintan is located in a secluded bay on the northwestern tip of Bintan Island which is really easy to access by travelers from Singapore. The location is surprised if most of the guests staying at this resort come from Singapore and foreign tourists from other countries. From this resort lies a wide panorama of the Tanjong Strait which is decorated by nyiur on the coast. Angsana Resort and Spa Bintan is one of the best luxury resorts on Bintan Island and is the main destination for tourists from various places because of its strategic location. That is, the luxury facilities available are ready to pamper guests who stay at the resort. Because it is truly strategic from a number of sightseeing objects and popular landmarks of Bintan Island. All Ria Bintan Golf Lodge, luxury resorts that have complete facilities that make their guests feel at home for a long time there. Facilities such as free Wi-Fi in all rooms, taxi services, Wi-Fi in ordinary areas, four-wheeled vehicle parking areas, and meeting facilities determine all guests’ needs are met. Ria Bintan Golf Lodge also has golf course properties that can be applied by guests. There is also a spa area for relaxation and many other facilities. This resort is present to meet the needs of a versatile accommodation for a traveler. 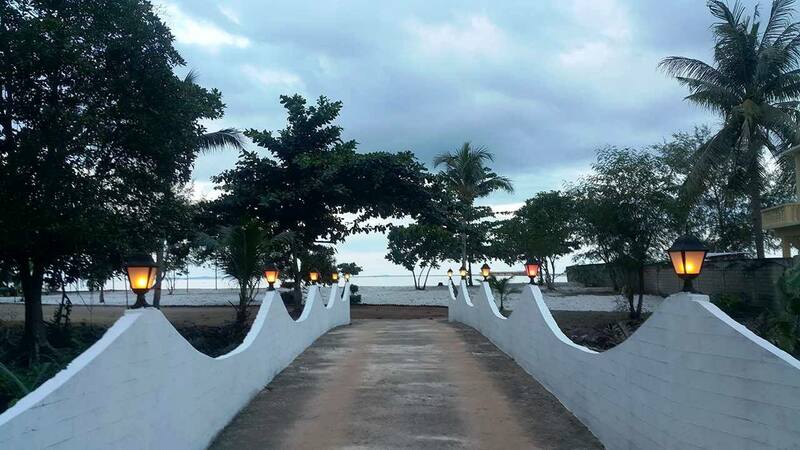 Bintan Sayang Resort is located in Kampung Pasir 1, Sebong Pereh Village, Teluksebong District. This resort offers an experience of watching charming sunrise and sunset in the same location. Your unique location is that the traveler does not need to move to other areas to pay attention to cool natural phenomena such things. Other facilities offered by Bintan Sayang Resort include a luxurious swimming pool, karaoke, banana boat, volleyball area, flying fox, diving, and fishing. Especially for the fishing pond owned by the resort, it is truly unique because the spot is integrated with the open sea so that the fish of various types. Sancaya is also included in the cool hotel suggestions on Bintan. To get to this area and experience all the amenities, you can simply reach the 10-minute journey from the BBT Ferry Terminal. There are many offers that will make you satisfied and comfortable. Not just like lodging, but also a great tourist destination. the area is covered by wi-fi, complete with an outdoor swimming pool. The facilities are also complete, how long even you here, will never get bored. can relax, then taste various and delicious dishes. Sancaya is also close to some of Bintan’s mainstay tourist points. The Busung Sand Hill in Bintan suddenly hits instagramers, especially the little ones of the Riau Islands. If you go through Busung Village on the Tanjungpinang-Bintan crossing, you will find a sand dune whose position is to the left of the road to Bintan. Essentially there is no special name for the dunes. Only local residents call Bukit Pasir Desa Busung. In the past, Bukit Pasir Busung was a former active bauxite mine exported abroad. But, as a result the sand mine was stopped by a local place. Then the area of ​​such things is no longer applied and it is allowed to do so until the result is realized into an attractive mound like a desert. Because there are no more mining activities and the place is open on the side of the road, it is not uncommon to attract the attention of pedestrians or people. Unfortunately, this has not been utilized as a good sightseeing area. Although lay, this area that was originally lay can be out of the ordinary when its photos appear on Instagram. The role of social media can help to make the area such things become hits among young young lovers of traveling so that many visitors are curious about the uniqueness of Pasari Hill in Busung Village. But it comes from mining. But, consistently presenting something for the visitors, is a panorama. Bukit Pasir stands out quite broadly. From a distance it stands out like a fine sand dune. But, if it comes closer it seems that the pebbles stand out a little rough. The color is yellow. When blazing, the color of the sand is more blushing. Aesthetics in a sandbar, safe enough to walk here and there, also climbing and downhill. Rough sand material does not make it easy to slip. No wonder the one given by Bukit Pasir is relief made from ex-mines. It’s as if in a vast desert. Anyway, it’s really worth it to fill up your post on Instagram. The Busung Sand Hills is surrounded by trees and shrubs that are not so high. In some areas, we also grow grasses such as dry reeds. Its location comes at morning or evening because during the day it will feel hot on the Sand Dunes. Moreover, it’s hard to find a shop selling food and drinks around the place if you feel hungry or thirsty in the hot afternoon. To visit Bukit Pasir, the village of Busung, come using a private vehicle because there is no public transportation to get here. If it’s not difficult because it’s right on the edge of the road. from Tanjungpinang city approximately 47 km or about 40-60 minutes. Well, for those of you who want to have a unique photo with a desert background style, you can visit here. BINTAN is indeed incessantly advancing tourism. Except for holiday areas that have been mainstream like Lagoi, there are some new areas that can be visited, including the Blue Lake. 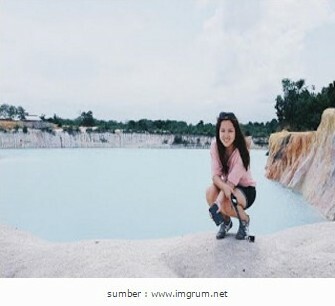 In Bintan, it does have some blue lakes which are excavated from land sand mines. There are at least three blue lakes that have been managed well and become vacation destinations are those in Busung Village, the blue lake in Kawal Village, and the blue lake in Lepan village. What can travelers do on the Blue Lake Lepan? Of course this area can be realized a small photo point. In some corners of the lake it has been realized in such a way that the photos of the visitors look cool. Especially now in the era of social media, everyone hopes to show optimal photos on social accounts, such as Instagram. Here, it has been realized that some of the wood conveyors with romantic powers go to the middle of the lake. In fact, at the end of a conveyor made of wood such things, there is a heart-shaped drop or love. Before reaching the end, there is a red gate that is also marked with a heart. Anyway, if you take a photo at the point of things like that you will feel truly romantic, especially if you take a photo with your beloved partner. Not only that, when visitors are tired of taking pictures in the heart-shaped strand, can row the canoe across the blue lake. When boating, don’t forget to stop by the tree house by the lake. Here, you can view the lake as a whole from a height above the tree house. Lake lake was created because previously some of the places in Bintan were realized by sand mining areas. After the sand mining is completed, then leaving a large puddle and gradually filled with rain water so that it becomes a large pool, resembling a reservoir. The blue color of the lake is thus created because the bottom of the lake consists of white sand and mud, plus clear water. So, when the sky is bright, the surface will reflect blue from the sky. There are two methods for taking the Lepan Village Blue Lake. First, through the western crossing of Tanjunguban – Tanjungpinang. The second passes through Sungai Jeram Village, Sebong Bay. But the western crossing is the easiest and can be passed by all the good motorbike or four-wheeled vehicles. Instead, visitors should cross the river by applying the crossing of wood known as pokcay. After driving from Tanjunguban for about 10 kilometers through the western crossing, you will find the Lepan Village intersection. The road to this village has not been paved or in other words it is still a dirt and sandy road. At the end of the road you should cross the river with Pokcay. One Pokcay is able to carry a four-wheeled vehicle and some two-wheeled vehicles along with passengers. After reaching the other side, just follow the village road and you will find a blue lake that is not that far away. Blue Lake is one of the names for an area that is precisely located in the village of Galang Batang, Kawal, Km 27, Tanjung Pinang. Where actually this area was formerly a mining pasis excavated by a handful of people. The excavation itself is carried out by applying heavy equipment “COBECO”, where the progress of taking sand is carried out continuously, which results in the area becoming a large and quite large hole, so that the water actually appears to be very blue, based on research a specialist is told that this happens because the soil is clay, and is dug deep so that the beam will create a blue reflection. There are so many things that have happened in this lake, believing or not taking many victims mysteriously disappeared. I don’t know what the cause is, the myth of this place used to be the cage of Jin and Satan, but because humans have ruined their place by making illegal mining, the result is that the residents have gone berserk, so many people have seen the sightings of beautiful female beings they call \ \\ “QUEEN BLUE \\\”. That is the myth, but you are not forced to believe that kind of thing, but after all that is there. This area is also the fruit of the hearts of young people dating, so that there are some of them carrying out adultery relations in this area, and quite a lot, and many of them are possessed after carrying out body relations around this lake that if night there is no light, there is only bushes that twisted it. Bloreng is a lake located in Bintan Regency, Teluk Bintan District, tembeling Tanjung Village. Bloreng Lake is a lake that was once a remnant of boxit piles carried out by some parties who have interests but now has become the PDAM of the surrounding community. Bloreng is a lake that has a very charming and amazing panorama that is only in the Tembeling Tanjung village. While Bloreng has a natural aesthetic that is outside the layman, but the aesthetics found in Bloreng have not been exposed and not widely known by the outside community or the community that is covered by the cape itself. The panorama found in Bloreng does not only spoil our eyes but the clean air can even be found there, unlike in cities. Refreshing panoramas and natural areas are objects that can be made an option for travelers who enjoy traveling and have a soul as nature lovers. Bloreng is one of the ideal options for ecotourism for visitors who want to find a new atmosphere. If you want to go there, you can copy the direction of the entrance to the dirty village. Kaprah-kaprah is about 200 meters away so you will find Bloreng Lake or the Bloreng Community PDAM. Indeed, the place is a little difficult to find because its location is hidden on cliffs. Here we are more spoiled with a panoramic view of the lake which is very amazing, very charming and very captivating to feel. For those of you who like or hobby in taking pictures, this area can be made by one of the regions to take pictures or take pictures of friends. Tembeling Tanjung Port has a good location for you to take pictures or take pictures because you have a view where you will be treated to a vast expanse of sea and also a mountaineering aesthetic from a distance. It’s not difficult to find the location of this port, you just keep on imitating the path of Tok Sadek. Later, if you have found houses in coastal areas, then you can just ask the residents who are there if you are lost, or if you have found a row of houses that are located on the coast so you can then walk to the plantar-plantar next to the house the residents, therefore you will reach the destination to tembeling tanjung port. Remember to watch your steps, if you want to visit there, because if you are careful in walking, you will be better friends. Here are some photos that we captured when we were in the port of tembeling tanjung. How nice it would be if the harbor was encouraged by other supporting objects such as a floating restaurant or floating restaurant in the middle of the sea, because this port has been encouraged with panoramas that can spoil the eyes especially if it comes at dusk and watch the sunset. this can be a fun event with family or loved ones. Previously, you have not yet mentioned the names of villages here, in tembeling tanjung village there are various types of village names such as bengku, bloreng, guntung, Tert (middle and sea), mansyur (big and kecik), and finally tembeling tanjung village. Now after you know the names of villages in Tembeling village, Tanjung, we continue to vacation destinations that you need to know friends. This second area is in the sea, to get to the sea so we should go towards the village of Mansur and Bloreng Village. Now there you take it to the left, then you follow the existing pavement. After walking for about 100 meters, you will pay attention to the street name “CENTRAL KETER”. Then you can imitate the path of such a thing and give 50 meters of the name of the street that way you will find the name of the road “KETER LAUT”. If you have met the name of the road, you just follow it, not too far from the entrance you will find a bridge that connects the land to the mangrove forest that we mean. Come on, hurry and visit and start exploring, dear friends, if it is not bright enough with the description that we provide, then review the guaranteed location. You will find it easier to search because it has a clear name on the street or you can ask the people there and make friends. unless it can be made as an object of vacation, the benefits of mangroves can be taken as well as dodol. so why mangroves need to be conserved because actually mangroves have considerable benefits. Former Mining Zones that Become Recreation Areas. There have been many examples of former metamorphosed mining zones into cool holiday areas. As an example on the island of Java there is Brown Canyon on the border of Semarang, Bukit Jaddih in Madura and many more. This phenomenon is apparently also found outside the island of Java precisely in Bintan Island, Riau Islands. Bintan residents know this area as Panglong Hill. Authentic residents of Bintan district certainly have seen that this area was once a hill that was quite high in the area. Such a hill puts an abundant source of energy in the form of granite. Until one day, granite rocks in Panglong Hill began exploration by PT Bukit Panglong. The granite hills in the Kijang region continue to be exploited by dredging methods to bombs. In a long period of time this hill turned into a crater with depths of up to 50 meters. Such craters are then filled with water from rain and also groundwater sources. Instead of being dirty and murky, the water that fills the pit of ex-mining quarries is actually clear and clean. When the weather is brilliant, the water will look blue. Although this is what makes the place Panglong Hill to exist among travelers. A traveler who is dominated by a young child really likes new areas. The status area is not an object of commercial vacation but the Panglong Hill with its blue lake has become an exciting recreational area, especially for visitors who come free of charge plus get a cool panorama bonus. The Bintan Regency Government even participates in realizing the potential of the Panglong Hill. They do not just look at the economic side but also see it as a great asset to be applied as a source of clean water for Bintan residents. Research about the appropriateness of water in the lake is even being carried out and it is unlikely that someday Panglong Hill will turn into an integrated vacation area. Have you ever visited Panglong Hill? The simplest and cheapest method to enjoy tourism in China is by visiting Chinatown, pagoda or monastery in each city. Luckily if you are on a tour to Tanjungpinang there is a magnificent monastery that can be visited for good religious sightseeing or hunting for photography objects. It is a Ksitigarbha Bodhisattva Monastery, an ethnic Chinese house of worship and an adherent of Buddhism in Tanjungpinang. This monastery was built in 2010 with a unique architecture equipped with statues of Buddhist disciples called Arahants in various facial expressions. The statues in the Ksitigarbha Bodhisattva Temple are embodied in various sizes. Starting from a height of 1.7 meters to 2 meters. Travelers from various places can even visit this temple well for the purpose of worship or just for recreation because this temple was opened for ordinary people. The best time to visit the Bodhisattva Ksitigarbha Temple is when it coincides with the Chinese New Year celebration. At that time this area will be crowded with tourists and pilgrims who will hold worship and pilgrimages. Its location which is built on a hill allows visitors to feel the panoramic view of Mount Lengkuas, the expanse of vegetable and fruit plantations that surround the monastery. For those who have the weight to visit this monastery, they can immediately go to the Km 14 domicile in the direction of Kijang, Tanjungpinang city. The location is not difficult to find and is only 10 minutes away from Raja Ali Haji Tanjungpinang airport, Riau Islands. Guaranteed your photo collection will be more beautiful when it comes to this temple. Is there really an igloo in Indonesia? Yes, it sounds strange, but you can find an igloo on Bintan! Indeed, it’s not made of ice, but the form is exactly the same. These dome-shaped buildings were formerly the furnace kitchen owned by residents of the Sea Tribe, before being ignored since the burning of mangroves to make charcoal was prohibited. Now, this brick dome becomes an object that attracts travelers. Try to take pictures among these unique buildings, surely your friends will be curious to make and try to guess whether this is the essence. Panglong Village is a holiday village located in Bintan Regency, in this village there is a unique charcoal kitchen and that is an area that lives for sea tribes known to experts in surviving in the sea, catching fish, and being able to survive in the ocean. The expanse of exotic beaches, as well as luxury resorts become the main magnet of Bintan Island which is able to attract local to foreign tourists. Not only has a beautiful natural charm, Bintan still puts a lot of unique and interesting vacation areas to visit. This area is Kampung Panglong which is the object of traditional holidays in Bintan. Panglong village is a settlement where the majority of the population lives as fishermen. But the difference is, this village has a unique building which is a charcoal kitchen that is shaped like a dome like an eskimo’s house. Apart from that, seafarers who live in this village are also known as conquerors of the sea in the past. They are known to have the skills to survive in the ocean, avoid storms, waves and are skilled in hunting fish. Geographically, Panglong Village is located in Berakit Village, Sebong Bay District, Bintan Regency, Riau Islands Province. To go to this village, travelers should at least reach a distance of approximately 50 kilometers from Tanjung Pinang which can be reached with a trip of about 1 hour. The location of this village is also quite close to Tanjung Berakit Port, only about 200 meters away. In recent years, Kampung Panglong has been legalized as a traditional holiday area by the local government due to the historical connection with the Kingdom of Riau, as well as the existence of the Sea Tribe who live in this village. This vacation area seems to be quite in demand by travelers, not only local but also foreign. They claimed to be curious about the life of the Sea Tribe, which is known to be able to survive in the sea. If you imagine you will find captivating natural scenery, the stretch of beach is complete with white sand, so forget about the desires of such things. Because you won’t find it in Panglong Village. This village seems to be general, just like other residents. But in the middle of this settlement, travelers will observe a unique building shaped like a dome. It was the building that used to be a charcoal kitchen. Unless hanging up as a fisherman, the residents of Panglong Village used to work as charcoal makers. This place is even known as the largest charcoal producer on Bintan Island in around 1920. The government even consequently prohibits this business, after a policy to conserve mangrove trees that are the main ingredient in making charcoal. 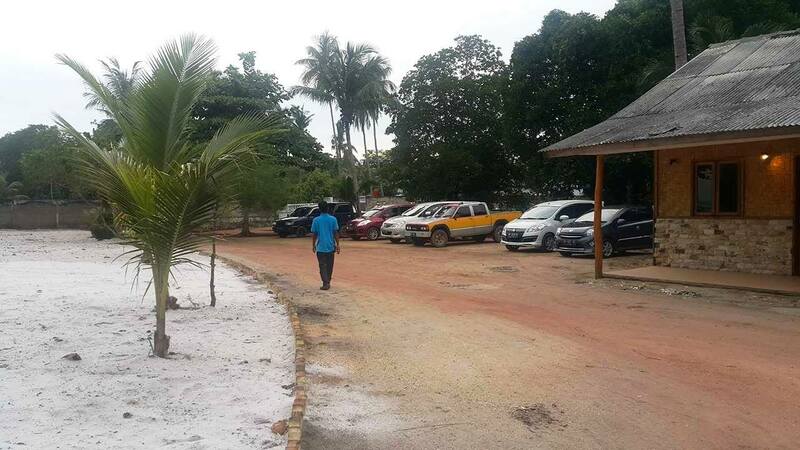 The charcoal production is consequently the result of stop and suspended animation, even charcoal kitchen buildings are permitted and now can still be observed in Kampung Panglong. Noted, there are still 3 restored charcoal kitchens without removing the original format. With the exception of Kampung Panglong, it is interesting to note, of course, the history of the Sea Tribe that now lives in this village. Sea tribes have been known to exist since centuries ago, they live daily life in the sea. Canoeing has become a home for them, at least one family has two canoes of different sizes. Small Sampang is used for fishing, although the larger canoe is the only living area for the kitchen to cook. This sea tribe just pulled over to the mainland to supply clean water, justify the boat, and avoid the storm. Sea Tribe expertise in fishing has no doubt. That said, in the time of the Kingdom of Riau the Sea Tribe also had a big role in maintaining the security of the sea. Shrewdness in forecasting the weather, avoiding the waves, and surviving in the wild seas became one of the important elements in the heyday of the Riau Sultanate in the past. Formerly, the Sea Tribe was also known to adhere to animism and did not know religion. They believe in spirits, and do certain rituals. But after they settled in Panglong Village, now they knew religion. Interfaith tolerance can also be enjoyed in this village, with mosques and churches located just separated by footpaths. About 40 years ago, the Sea Tribe began to settle in Kampung Panglong. The government also provides guidance to the Sea Tribe to settle in order to receive instruction, a more suitable area of ​​residence, and ensure health for the fruits of their hearts in the future. Now some large citizens become fishermen, and still inherit ancestral expertise in fishing. The facilities in Kampung Panglong are unfortunately still relatively minimal. It takes the local government seriousness, in building infrastructure to provide comfort for travelers. There is still no ordinary restroom here, but travelers can use the restroom owned by local residents by asking for permission first. In this village, mosques and churches have also been built for travelers who want to worship. Travelers do not even need to worry if they feel hungry, because around the village there are already some traders and food vendors. Visitors can also taste seafood dishes, ending up visiting Panglong Village. If you wish to spend the night, travelers can choose lodging around the Sebong Bay District or choose beautiful resorts on Mount Kijang. Visiting this holiday area, will provide an interesting experience for travelers, along with some of the activities that travelers can do when they are in Panglong Village. When visiting Panglong Village, you can see the daily activities of the Sea Tribe in search of fish, preparing canoes, nets and more. You can also hear the story of the greatness of the Sea Tribe from the village elders, who were formerly known as the rulers of the sea, and keen in reading weather forecasts. Not only that, here you can also observe the aesthetics of a charcoal kitchen shaped like a dome. This charcoal kitchen has its own uniqueness, which is capable of inviting travelers to attract energy. With the village elders, you will be told the story of this charcoal kitchen. This area seems to offer the other side of Bintan Island, which might be a magnet for some people. Photo taking is also a busy life that you can do in Panglong Village. You can photograph the daily activities of the local community, as well as the uniqueness of the charcoal kitchen that has now been preserved into a holiday website. You can also take pictures on the beach, there are some interesting objects that you can capture in this area. Except that you can also capture the boats owned by fishermen, whose form is not much different from the sampan used by the Sea Tribe to survive in the middle of the ocean. When local people are still doing various rituals, as a format to preserve customs that you can capture in a photographic work. Geographically, this mosque is located in Tanjung Uban, North Bintan District, Bintan Regency, Riau Islands Province. To go to the Baitul Makmur Tanjung Uban Mosque, travelers must at least reach a distance of 80 kilometers if from Tanjung Pinang. Such travel takes at least 2 hours using a four-wheeled vehicle or motorbike. 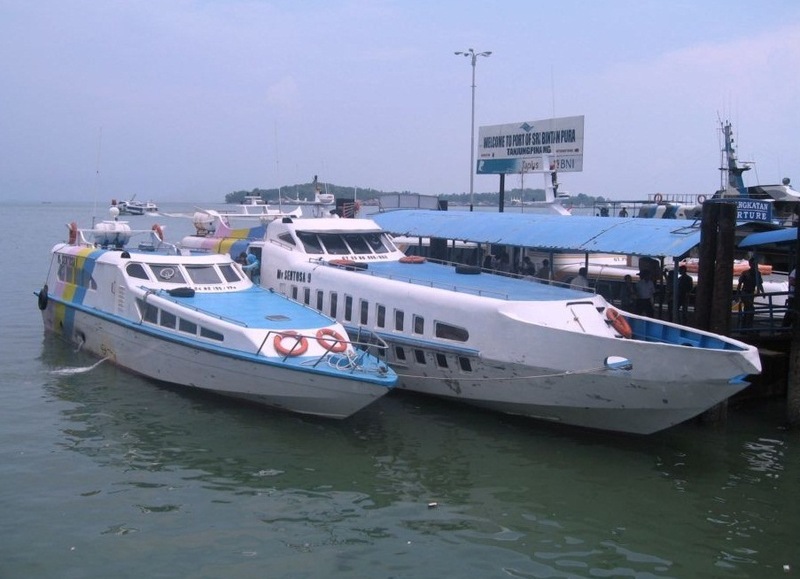 If visitors come from Batam, they can use sea ferry or speed boat transportation from Punggur Lake Port. The trip using this speed boat is much faster, it only takes about 30 minutes to reach Tanjung Uban. From Tanjung Uban Harbor, travelers instead just continue to travel as far as 2 kilometers to reach the mosque. This mosque was built on an area of ​​1.6 hectares which is waqf land from the local community. The construction itself began in 2008, and the mosque began to be used in 2012 even though the construction work has not been fully completed. This mosque is estimated to be able to accommodate up to 3,000 worshipers in the main hall, as well as 6,000 worshipers with the mosque’s courtyard. The Baitul Makmur Mosque in Tanjung Uban adopted a modern architectural style combined with traditional architecture. This two-story building also becomes one of the largest mosques in Bintan. The architectural aesthetics can be seen in the exterior and interior components of the mosque, which look magnificent, sturdy and also have artistic points. On the exterior components, this mosque is coated with a striking color so it looks eye catching. Colorfull feel really feels on the outside of the mosque, the yard that has been paved is also decorated with beautiful paint colors. The existence of a garden in the courtyard of the mosque, is increasingly beautifying the atmosphere and making a beautiful nuance. The Baitul Makmur Mosque of Tanjung Uban has 5 domes, with 1 main dome and 4 small domes surrounding it. This dome is made of mild steel, and rust dams. The main dome has a diameter of 9 meters, which is said to make the dome costs up to 600 million rupiah. The dome is instead decorated with colorful ornaments that symbolize the diversity of tribes and nations of Muslims. Looking into the mosque, visitors can find two floors where the ground floor of the building is realized as the main worship room. In the mihrab component, it can be seen that there are Arabic calligraphy articles and ornaments made of teak wood carvings. Such ornamentation also adorns the Qibla wall component in the spiritual space. The mihrab room has a height of about two meters, and is also decorated with arabic calligraphy around it. In the component in the Baitul Makmur Mosque in Tanjung Uban, visitors will also find some antique clocks, which are located next to the mihrab room. The interior component is also decorated with beautiful lights, which adds to the magnificent feel of this building. There are sturdy pillars that support this building, and there are no insulation in the room. The mosque which is the icon of North Bintan, and the praise of the local community was built in the highlands. When in this mosque, visitors will also be treated to a panorama around Tanjung Uban that is charming from a height. From this mosque also stands out the view of the ocean that separates Bintan Island and Batam. The facilities contained in the Baitul Makmur Tanjung Uban Mosque are also quite complete. In the main room of worship, it has been equipped with a sound system, as well as a fan to provide comfort to the worshipers while performing the prayer services. Apart from that, the mosque also features 100 ablutions, and 12 small rooms. Not only that, the mosque also has a secretarial room, a means to hold marriages, teaching rooms, a priest’s hall, TPQ, and a memorial room. There is also a footwear storage area that can accommodate up to thousands, as well as a parking area that is quite spacious and can accommodate 750 motorbikes and 150 four-wheeled vehicles equipped with some guards. Around the mosque, even a park has been built that covers 4,000 square meters. This park is decorated with a variety of plants and flowers so as to make the atmosphere beautiful and natural. In the future, this mosque will also be added facilities such as a canteen, health clinic, free medical treatment facilities for the poor, four-wheeled vehicle service, as well as a kiosk that provides Muslim clothing and the need to worship. Ending visiting the Baitul Makmur Mosque in Tanjung Uban, travelers can also have a holiday on their own with a variety of delicious dishes typical of Tanjung Uban. Travelers can also visit the port, to taste processed seafood dishes such as crabs, grilled fish, shrimp and many more. If you wish to spend the night, there are also hotels and lodging that can be chosen around Tanjung Uban. Visiting the Baitul Makmur Mosque in Tanjung Uban, can be an interesting alternative religious holiday in Bintan, here are some activities you can do while in the mosque. When you visit this mosque, you will be treated to a beautiful mosque and really different from other mosques in general. After worshiping you can go around feeling every corner of the mosque that stands majestically in Tanjung Uban. Ranging from colorful ornate exteriors, 5 domes that signify the pillars of Islam, as well as a colorfull courtyard that looks beautiful. Not only that, you can also observe in the mosque to feel the aesthetic of the calligraphy that adorns this building. There are various carvings from teak wood, as well as gold-colored calligraphy that adds to the aesthetics of this mosque. In mihrab, and the Qibla wall is also decorated with Arabic calligraphy. In the mosque you can find antique clocks, as well as unique decorative lights. Not only is the aesthetics of the Baitul Makmur Mosque in Tanjung Pinang alone which is capable of being a tourist attraction, but also natural scenery that can be watched around the mosque. This mosque is indeed standing on a plateau, so that visitors can observe the vast expanse of the ocean, and the panorama of Tanjung Uban from a height. You can go up to the second floor, and go to the balcony of the mosque so that the natural panorama becomes more prominent with light. Even the breeze will always accompany you while in this mosque. The existence of a garden that is decorated with various flowers and green plants, is also a complement and makes beautiful and natural nuances. You can feel the panorama of the surroundings, while waiting for the time to break the fast. For those of you who have a hobby of photography, this mosque can be your next destination in taking photos. You can capture the architectural aesthetics of the mosque, which looks beautiful and unique decorated with colorful ornaments. If you wish to receive a more captivating view, you can take photos using drones from the air. Many visitors who spend themselves in self-defense with the aesthetic of the mosque end up praying. One of the interesting points of course is the page decorated with colorful paint. This point is superior for visitors to take selfies, and of course truly unique and instagramable. This area is suitable for those of you who like to upload photos on social media. Take the city of Kijang. With a distance of less than 30 minutes from Tanjungpinang, Kijang can be a vehicle for sightseeing if you are bored exploring the coastal area of ​​Trikora on the other side of Bintan Island. Deer does not have a beach as beautiful as Trikora Beach. However, that is not the goal. An excursion to Kijang is another system celebrating a happy weekend. Here, there is Nurul Iman Mosque, the largest mosque in Bintan Regency. There is also the Pujasera area that sells Bintan specialty snacks. In front of him, there were ex-mining pools which were soothing to the eyes combined with the shade of trees that lined the edges. Shifting two meters in length, there is a mini zoo. Don’t imagine that the zoo in the east of Bintan has a large collection of animals that can be exhibited, such as Ragunan zoo, Jakarta. Because judging from the name; Mini Zoo, it can be imagined that the zoo which is open every day from 09.00-17.00 WIB only tells a small number of fauna in the wildlife world. The name is also mini. There are turkeys, deer, iguanas, sun bears, crocodiles, orangutans, chimpanzees, Javan gibbons, ferrets, rabbits, bats, pythons. There are also various types of birds that are caged. Ranging from older siblings, parakeets, turtles, ostriches, parrots, eagles, peacocks, and hornbills. All animal collections can be felt free of charge by visitors. Because there is no entrance fee charged. No doubt, because it is free, visitors from the Kijang, Tanjunguban, and Tanjungpinang areas boom and fill the zoo. Normally, on weekends, Saturdays and Sundays. Visitors to the Mini Zoo also vary. Starting from the little ones, a family, to a pair of lovers who wander over the weekend there. The impression is various-types. For most little ones, visiting a zoo is observing animals that were not familiar to them before. While for families who spend the weekend there, have the impression that the Mini Zoo in Kijang is a comfortable area for the end of the week. After being satisfied around the zoo, don’t go home. Ideal across the street, now there is the Kijang City Walk yard. Built through the funding from the central government, this green open space is equipped with a small playground. While on the other hand there is a large yard that can be a small area of ​​cycling. Browse the Natural Aesthetics that are Still Virgin. Senggiling Beach – have you introduced to a natural outing to be exact on this one beach excursion? For those of you who are living on Java, it may sound unfamiliar to mention this sightseeing area. But if you live in the Riau Islands, it must have become an area of ​​sightseeing that is commonly heard and hunted by tourists or travelers. It is clear that the people of Riau Islands know exactly about this excursion because this sightseeing area comes from there. The land of Riau Islands, which has a large number of zones consisting of oceans and only around 5% is the land that is very dominant, occupied by water sightseeing areas especially the beach itself. Senggiling Beach is a sightseeing area in Bintan Island, Riau Islands. If only I could say, apparently this beach is a natural aesthetic that is still untouched and its existence is not yet widely known as the usual sightseeing area. This beach, if viewed according to the coastline, is very long. This kind of white sand that is owned by the beach is typical and should be felt. For those of you who like to visit water attractions like this beach, Senggiling beach can be your new reference in feeling this kind of power of creation. 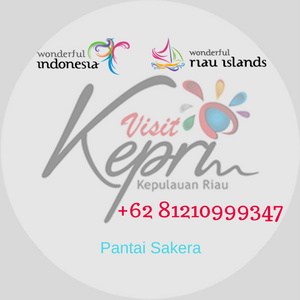 Very suitable if you are considering traveling here especially with your beloved family or your dear friends. For lovers of traveling, natural sightseeing cannot be missed even one. All of them should be pijaki so that the nuances of the traveler reach the heart and become a passion for the traveler that way, for that they really need to change the natural aesthetics that exist throughout the archipelago including in the Riau Islands. The facilities provided are various, ranging from cheap prices. Senggiling Beach is adjacent to Lagoi’s integrated sightseeing area. Unless it’s very close to the resort so you can rent lodging there. There will be a guard post so you can report while visiting there. Instead, the post is the property of a company plantation, that’s why you should be polite and good if you visit Senggiling Beach. A lot of charm that you will get when visiting this one sightseeing area. The beach presents such a large and strong bark that visitors can feel while on the beach. The sea is even very clear and uncontaminated so it is so cool. The brilliant colors and blue that make the charm of this beach feel beautiful. This enchantment makes this beach a prime area for you and your family to feel the beautiful nature of the landscape and free from the noisy and dirty city environment. It is certain that when you are traveling except feeling the nature of your trip, you will then hunt for selfies, hunt photos with friends or family when you arrive there. The charm given by this beach can make you who likes photography can also be channeled. Not only those who like photography, but those of you who like to take pictures can even be channeled there. Feeling nature while the photos are shared with other friends who have not had time to visit is fun and addictive. That’s a lot of people who have fun taking pictures then uploading them to social media accounts that they have as a form of showing the natural aesthetics that he has explored. You really need a tour guide, or the term people know and as a guide for your trip while going to the beach location. According to the terrain that was passed to get to the beach, it was in desperate need of a motorbike or two-wheeled vehicle if you wished to arrive at this beautiful location. The tracks that you will pass are the local people’s plantations there or even belong to the company, so be careful and be good as newcomers. Don’t forget to prepare supplies that have been brought from home. You really need to be careful in feeling this one outing, because natural sightseeing is still rarely touched by people, so many animals such as snakes can be found. It’s better to just feel from the beach lips, don’t need to swim. This method of feeling aesthetics on the beach is enough to hunt as many beautiful photos as possible. If you wish, you can have camping or camping to be with friends or even your own family. Regarding the hours, there is no legalization of opening hours and there is no entry ticket if you wish to visit such locations. The location of this beach is still relatively natural and it is rarely known by the wider community that in its maintenance it has not been fully legalized. But you don’t need to worry, because then you can feel as much as your expectations. That’s a little story about Senggiling Beach’s natural sightseeing. Hopefully it can be a new reference in traveling and on vacation. Bintan Island is an island located in the Riau island province. This island is the largest island in the Riau Islands and very close to Singapore. In the first century AD, the island became a flagship stopover for trading ships from China and India. Unless it is located in a strategic location, precisely between Singapore, Johor Baru and Malaysia, the island is also rich in holiday potential. One of the most popular holiday areas in Bintan Island is Trikora Beach. Trikora Beach is located in Malang Meeting Village, Gunung Kijang District, Bintan Island, or about 45 km east of Tanjung Pinang city. This beach is divided into four components, which are Trikora 1, Trikora 2, Trikora 3, and Trikora 4. The road to access Trikora Beach is quite good, instead it can be passed up to four lanes of four-wheeled vehicles. To get to this beach, you can reach the trip from Tanjung Pinang to the border of Bintan Regency. Unfortunately there is no access to a common transportation that is capable of accompanying you to this beach. Therefore, it is recommended that you rent a four-wheeled vehicle and the driver. Or you can rent a motorbike at a rate of approximately 100,000 Rupiah per day. Although to rent four-wheeled vehicles around 200,000 to 400,000 Rupiah complete with a driver. Based on the legend circulating in the community, the name Trikora itself was taken from the “three corral”, which is the name of a foreign traveler when they visited this beach. Although based on other sources, the name Trikora was taken from one of Indonesia’s history Tri People’s Command. At that time this beach was the outermost fortress of Indonesia in a warm news “Down with Malaysia”. The trip to the beach is quite long and tiring, but don’t be disappointed first. Along the way to this beach, you will be treated to amazing panoramas, such as panoramic views of the ranks of fishing villages, the location of conservation of seagrasses and mangroves, as well as beautiful luxury resorts. Arriving there, you will be treated to a panoramic view of soft white sand, clear blue sea water, complete with coconut trees dancing for the sea breeze. This beach is quite shallow with the waves that are not too big, so you and your little ones can carry out a busy swim. Even so, you must be careful because when the tide is high, the flow of water can be quite strong. There are many trees lined up on the beach side for sheltered areas. Except for coconuts, the types of trees that grow here are mangroves, which can also be protective from the sting of the sun. You can stroll along the coastline while feeling the breeze or trying to curl up on the warm sand of the beach. Except for that, you can feel the underwater aesthetics on this beach by trying snorkeling activities. One of the interesting things you can get here is kelong. Kelong itself is a fish trap made of wood and applied by fishermen to install fishing nets in the middle of the sea. Kelong is supported by plastic drums to float on the surface of the sea. This fishing system is favored by fishermen at Trikora Beach because it is easy to move to suit the will. Across from Trikora Beach, you can find the Cave of Santa Maria. This cave was built by Vietnamese refugees who were protecting themselves during the war. Around the Cave of Santa Maria overgrown with large trees with leafy dead leaves hanging from the mouth of the cave and made it look even more charming. Around the cave also grow beautiful bougainvillea flowers. Near this cave is a church for those of you who want to pray prayerfully. Once satisfied exploring the Trikora Beach, don’t forget to stop by the Sungai Enam area. This area is the location of superior cuisine for tourists after visiting the beach.For those of you who are seafood enthusiasts, you can try the typical gonggong dishes from Sungai Enam. Gonggong is a kind of snail animal that has a squid-like race larger than other snails. Like the presentation of mussels, generally boiled barks are then felt with spicy peanut sauce.The food you have to try except seafood here is the fish brains. Bintan Island is familiar with the typical foods of the fish brains. The fish brains here are different from the brains of other fish. With formats such as pepes, these fish brains contain mackerel fish that are ground very soft. Of course it tastes delicious if you feel it with hot rice. Lagoi Beach is the most popular beach on Bintan. This beach has an amazing panorama, and is a destination for foreign and domestic travelers. There are luxury resorts around, which also co-manage some of these beaches. There is no doubt that Bintan is one of the tourist destinations that is not only visited by local travelers but also tourists from various parts of the world. The largest island in the Riau Islands Province, offers a variety of exotic, comfortable beach charms and luxury resorts that are nearby. Lagoi Beach is one of them. Lagoi Beach is a mainstay holiday destination on Bintan Island, which is famous for its wide white sand and cleanliness. No wonder if this beach is always capable of attracting tourists to visit each year. This beach aesthetic is even recognized internationally, and in line with the beaches in Bali, and Lombok. Geographically, Lagoi Beach is located in Teluk Sebong District, Bintan Regency, Riau Islands Province. To visit this beach, travelers should at least reach a distance of about 65 kilometers from Tanjung Pinang. This trip is estimated to take approximately 1 hour 30 minutes. But if visitors come from Batam, they can apply speed boats or ferries to cross to Bintan Island. Arriving at Tanjung Uban Harbor, the journey to Lagoi Beach takes about 40 minutes. Travelers can apply private vehicles such as four-wheeled vehicles, good from Tanjung Pinang or Tanjung Uban. But there is no regular transportation that serves this route, travelers can rent a four-wheeled rental vehicle if they don’t bring a personal vehicle. When arriving at Lagoi Beach travelers will be pampered with a clean, charming beach, with a stretch of white sand stretching wide along the eye paying attention.Around the beach, you can find the coconut trees soaring, adding to the exotic feel of the beach. A breeze that seems to be incessantly blowing, will always guide travelers when they are on the beach. In essence not all beaches located in Lagoi area can be visited by travelers. There are some beaches that are managed exclusively by hotels and resorts, so if you expect to feel the beach even visitors should first stay at the resort that way. It is really unfortunate, some large resorts on the beach are managed by foreign investors. Lagoi Beach is indeed one of the holiday destinations for foreign tourists, and also neighboring countries such as Singapore and Malaysia. The distance from Singapore to the beach is even close enough, only about 45 kilometers. It’s not strange if many Singaporeans spend time on this beach. Even based on the info that blew, the currency applied around Lagoi is not Rupiah but Singapore Dollar. Even so, travelers can still consistently feel this beach aesthetic by visiting Lagoi Bay. 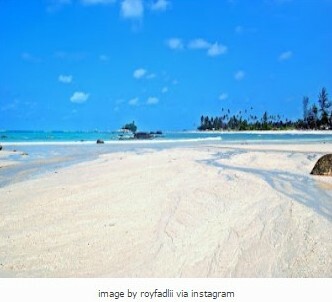 Lagoi Bay is still the area of ​​Lagoi Beach, except that this area is not managed exclusively so that travelers can freely visit. Tourists can feel as much as they can feel the blue ocean expanse, with waves that are quite friends. At Lagoi Beach travelers can work on a variety of activities such as swimming, fishing, sunbathing in the sun, playing the waves, and feeling the natural aesthetics of the underwater by diving or snorkeling. Underwater charm offered is even quite extraordinary, there are a variety of charming coral reefs, as well as colorful fish swimming behind coral reefs. Around Lagoi Beach is also built a neatly arranged garden, and decorated with various green plants that embody beautiful and natural nuances. The park is equipped with a variety of facilities that are quite complete, such as colorful umbrellas, as well as huts that can be applied to rest. In this park, travelers will enjoy the sensation of a luxurious reception, which can be felt for free. Lagoi Beach is an elite vacation area, arranged neatly, professionally and supported by a variety of truly complete facilities. Even though some of these facilities are owned by luxury resorts, there are also ordinary facilities that can be felt by travelers. On this beach there are facilities such as regular toilets, large parking areas, parks, and also mosques for worship. Around the coast there are also Minimarket, self-service kiosks, ATM machines, Plaza Lagoi, and also various souvenir stalls. After visiting the beach, travelers can shop for souvenirs for souvenirs in various kiosks and plazas. Except for that, there are lots of cafes, cafés and restaurants that offer delicious cuisine. One of the typical Bintan dishes that should be tried is the brain-brain and gonggong satay. Not only that, on Lagoi Beach travelers can find fishing equipment rentals, snorkeling equipment and also tools for diving. Travelers can also go to the largest swimming pool in Southeast Asia not far from the beach, called Treasure Bay Bintan. In this area there is also an artificial lake that is truly charming. For travelers who like to play golf, there is also a golf course that offers a variety of luxurious facilities and is located right on the beach. The location is even close enough, of course you should spend a lot of money to play golf in this area. 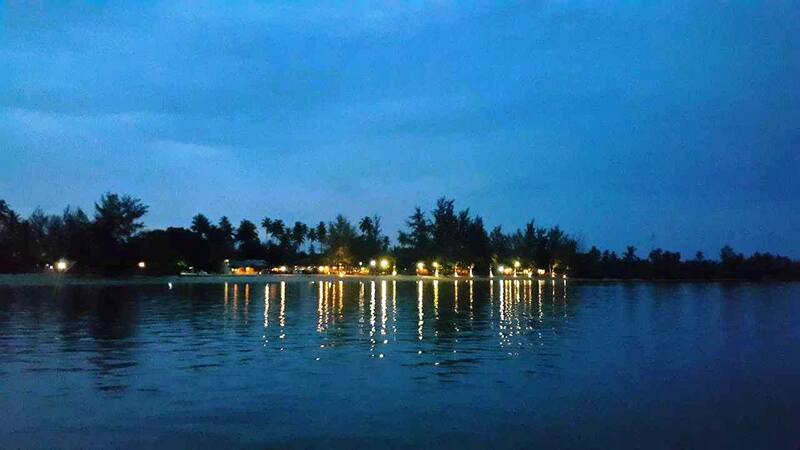 If you wish to stay overnight, travelers can choose hotels and resorts scattered around Lagoi Beach. Starting from low-priced hotels, to five-star can be an alternative traveler to spend the night. Luxury resorts are even equipped with facilities that will spoil visitors. Spending time traveling on this beach, can provide an interesting and fun experience. Here are some of the activities you can do when you are on Lagoi Beach. When you visit Lagoi Beach, you will be presented with an exotic beach with a wide expanse of white sand. You can feel this beach by swimming, playing water, chasing waves, or just relaxing on the beach to pay attention to such a beautiful panorama. Except for those of you who like snorkeling or diving you can even feel the underwater natural aesthetics of Lagoi Beach. If you don’t bring snorkeling equipment, you can rent it around the beach. On this beach there are some interesting points, which have a variety of charming marine biota such as coral reefs and various types of ornamental fish. This area is also truly appropriate for those of you who hope for refreshing. Ended feeling the aesthetics of Lagoi Beach, incomplete if you have not visited the mangrove forest in the Sebong River. By renting a boat, you will be taken to explore the aesthetics of the Sebong River which has mangroves beside its left and right. This river is truly exotic, offering natural natural aesthetics and clear water. You will trace the 6.8 kilometer river. Not infrequently you will find a variety of wild fauna, such as chimpanzees hanging, snakes and mangrove crabs. This area is really interesting as a holiday destination, except for the various fauna that you will see, you can also feel the fresh air that is still free from pollution. For those of you who like fishing, the Sebong River also offers various types of fish that are ready for you to catch. If local fishermen are not leaving for sailing, then you can rent their boat for fishing in this river. Except for that, you can also fish in simple lodges that have been provided for visitors. When you are satisfied playing on Lagoi Beach, don’t forget to stop by Treasure Bay. The location is even really close, only about 10 minutes by applying a four-wheeled vehicle. 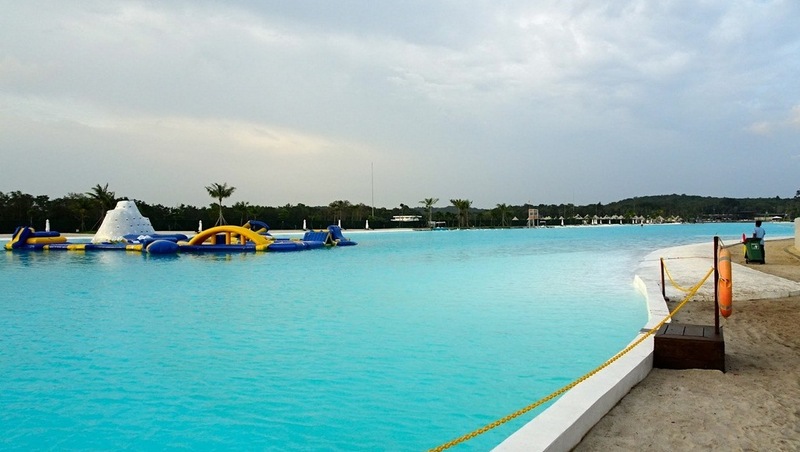 At Treasure Bay, you will find a giant swimming pool with a variety of exciting and challenging game rides. It is said that this pool is the largest in Southeast Asia. At Treasure Bay you will be spoiled with various games like bumper boat, jetovator, sea scooter, kayak, aquaglide and many more. This area is also equipped with a variety of super luxury facilities such as resorts, and cafes. Except for that, there are also water sport rides that are suitable for honing adrenaline. When in this holiday area, it feels incomplete if it does not perpetuate natural aesthetics by taking pictures. If you have a hobby of photography, on Lagoi Beach there are lots of objects that you can shoot with a camera. 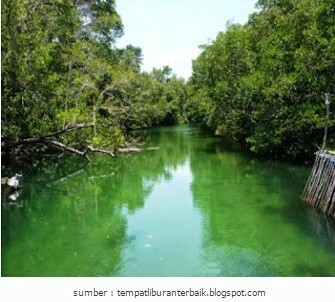 Except for that, you can also take pictures on the Sebong River, which offers the natural charm of mangrove forests. On Lagoi Beach there is an artificial park which also offers charming photo hunting spots. Here you can have selfies with friends and family. This park is truly instagramable, so it’s really right for those of you who like to display photos on social media. Lagoi Beach is also an attractive alternative, for those of you who want to work on a prewedding photo session. To visit Lagoi Beach, there is a beach side that is free of charge or free of charge is in Lagoi Bay. Although there are some beach components that are managed by the resort, so travelers should stay first especially at the resort. Even though for Treasure Bay, everyone should pay Rp. 100,000 not including tariff for playing water rides. Be consistent in maintaining the cleanliness of the area you visit. Riau Islands Province has a village called Pengudang which is located in Teluk Sebong District, Bintan Regency. There is a beach called Batu Junjung Beach (named for this because it has a large stone and one of the stones that has such a unique shape). Pengudang Fisherman Boat, an object of photos we have captured. Fishermen are one of the jobs that have fishing activities and also double aquaculture or aquatic plants. With daily income levels, and also uncertain, then also rests on certain seasons. Therefore actually the work as a fisherman often cannot fulfill the daily needs of fishermen. Hygiene is one component of faith, therefore from that we as human beings duly maintain cleanliness and also take care of holiday areas that are still beautiful and hopefully we can return them in full format to our grandchildren, aamiin. Many travelers have been too concentrated to explore the aesthetics of Indonesia’s tropical island to the east until it is unconscious if on the west end of the country is a hidden tropical paradise called Sand-Grounded Island. This is one of the islands dubbed the Tropical Paradise of the South China Sea. Sand-Sanded Island, still unfamiliar with the name of this island? What about Lagoi Bay or Bintan Island? Well, maybe you’ve heard the name of Bintan Island, while you have never set foot there. What is special about this island. Beralas Pasir Island is one of about 3 thousand large and small islands in Bintan Island. Bintan Island itself is the largest island in the province of Riau Islands. On this island there is the provincial capital is Tanjungpinang. What is our concentration is the holiday potential that this island has. Maybe not many people know that Bintan Island is a tourist paradise for foreign travelers, one of them is a Singaporean traveler, because the location of the island is really close to the country, so just need a crossing for less than an hour. On the east side of Bintan Island, this is the Sand Island of Sand. The blade is small and uninhabited. There are only a few officers who guard and care for the island. To get there the traveler must cross from the port of Teluk Bakau which takes about 20 minutes. Most travelers who visit the island are guests from luxury resorts around Kawal, Teluk Bakau and Trikora. Activities on this island are not far from water activities, especially snorkeling. The waters around Beralas Pasir Island are indeed known to be truly clear with well-maintained corals. Snorkel points are usually done around the shallow waters of this island or near Nikoi Island which is located not far from Sand-Sanded Island. Apart from that, the maintenance of marine aquatic ecosystems around the island makes it inhabited by many species of fish. Thus, this island is truly worthy of being used as a fishing point. But those who do not dare to snorkel can also land on the beach and run activities such as beach volleyball or just playing sand and playing water on the beach. The road to Sand Island is only reserved for holiday activities. So the only method to come to this island is to join a vacation package offered by a holiday agent from a resort or a local tour agent.